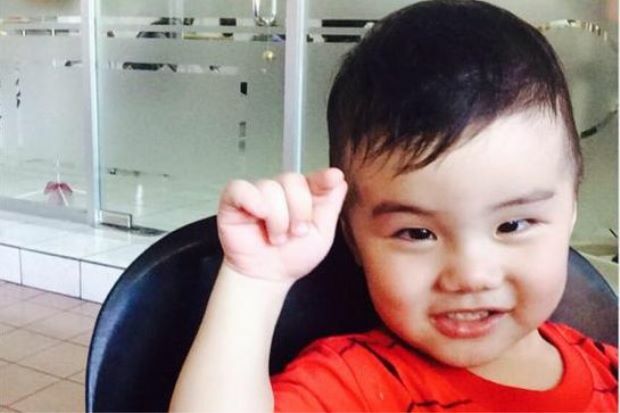 KOTA KINABALU: Anxiety is growing among the family of missing three-year-old Low Meng Yew (pic) (also known as Liu Mingyou) who was kidnapped during a carjacking early Friday. There has been no word or calls since he went missing over 24-hours earlier as a special task force continue to investigate his whereabouts while they stepped up checks on all air and sea exit points from Sabah. Kota Kinabalu district police chief Asst Comm Jauteh Jikun said that they have yet to get any breakthrough in the case. “There has been no calls or any leads on the kidnapper,” he said when contacted on Saturday. Meng Yew was taken by a suspected car thief who drove off with his father’s (Low Yee Sheng, 31) four-wheel drive vehicle that left with its engine running as he had gone to use the toilet at a petrol kiosk at Kg Air in town here at about 5.50am on Friday. The car was found at the Atkinson Tower parking lot along Signal Hill about 2.5kms from the scene at about 9.30am the same day but the child was missing. Police had said that Yee Sheng had left his house in Telipok with Meng Yew after a quarrel with his wife at about 5am and headed straight into the city’s Kg Air area in town when the incident occurred. Police, who recorded statements of family members, believe that the case is not be related to any family disputes. They now suspect it was a crime of opportunity as the vehicle was left running. In a Facebook posting family member Michelle Lim said they were offering RM20,000 reward for the return of Meng Yew who was last wearing a green shirt and blue pants. The family who have yet to make any appeals through the mainstream media have been posting and sharing the boy’s pictures and making appeals on Facebook urging people with any knowledge of the boy’s whereabouts to to call 013 8685336 or 013 8605336. This entry was tagged 1Malaysia, klcc, kota kinabalu, kuala lumpur city centre, Low Meng Yew, Low Yee Sheng, malaysia, malaysia lah, mh370, one malaysia community, sabah, three-year-old. Bookmark the permalink. This is a very harrowing experience which can happen to any one of us. I hope they’ve found Little Mingyou, safe & well.